Brussels sprouts have been a darling on restaurant menus since about 2012, commonly roasted, almost always paired with thick cubes of bacon…you’ve seen them listed there beside the “scoop of truffled mac ‘n’ cheese”, right? On a recent trip to LA, however, they were not relegated to the “sides” section of the menus. Brussels spouts were in everything from starters to pastas and especially in salads, just another green to throw into the mix. I found myself craving them when I returned home, along with the other things I ate almost daily in LA: still-darling kale and ever-popular avocado. I started making this salad regularly to get my fix of all three in one, trendy swoop. Don’t turn your nose up if you think any of these is no longer in vogue. This is a salad to love long-term, high in flavour, fresh but nutty and rich too, perfect for lunch or as a starter. There’s no reason you can’t swap out or even add another roasted vegetable, maybe less-cliché and less-LA, than the sprouts. Don’t even think about omitting the avocado, however. Avocado’s been cool way longer than us. This salad is great warm or at room temperature. It can be made a few hours ahead but add the dressing and assemble only when ready to serve. It’s best to slice the avocado close to serving time too. *If you don’t have hazelnut oil, substitute with more extra-virgin olive oil, and add a splash of sesame oil if you have it. Add shallot slices to a small, non-reactive bowl and pour vinegar over top. Muddle with spoon or whisk and set aside. Preheat oven to 350F degrees. Meanwhile, prepare the Brussels sprouts: tear off and discard outer darkest/spotted outer leaves. Trim the bases off and discard. Now peel off any looser and large outer leaves and rinse them and the Brussels sprouts of any dirt and drain well. Drizzle with extra virgin olive oil, season with salt, and place on baking sheet. Drizzle kale with extra virgin olive oil and season with salt and place on a separate baking sheet or tray, lined with parchment paper. Bake for 10 minutes, then stir Brussel sprouts and check on kale. If the kale has darkened and softened you can remove it now or let it go for a minute more–the goal is not kale “chips”, just softened and roasted kale. Return the Brussels sprouts to the oven and roast for 5-10 more minutes until browned at edges, careful not to burn. In the last 5 minutes, add the walnuts to a corner of one of the trays or to another small baking tray to toast. In the meantime, make the dressing. Strain the shallots from the vinegar and discard. Whisk the hazelnut oil and 2 tbs of extra virgin olive oil into the vinegar. Season with salt and pepper. Cube avocado and set pieces in a shallow bowl pour juice evenly over top to cover all exposed sides and set aside. When ready to serve, add the avocado and juice to the dressing and mix gently. 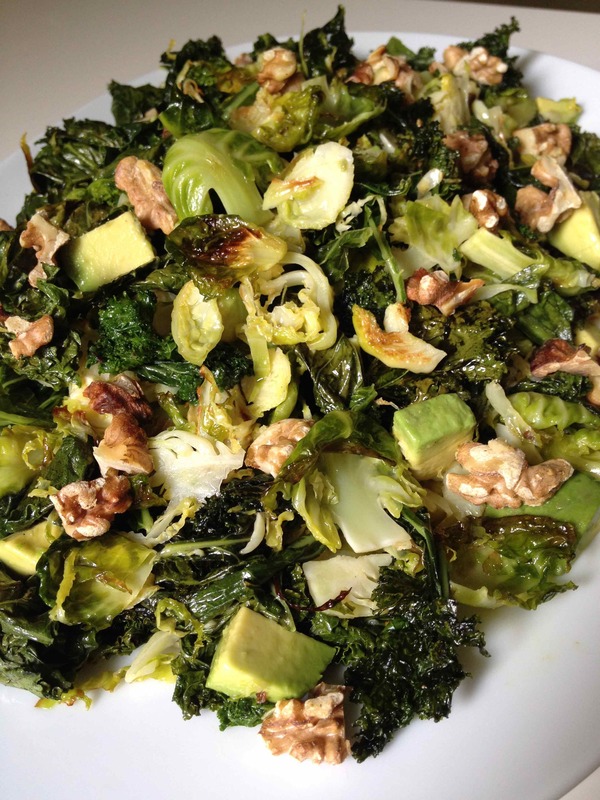 Toss the Brussels sprouts and kale (warm if possible, unless making salad in advance–see headnote) in the dressing to coat well but be careful not to mash the avocado too much. Sprinkle walnuts on top and serve. This story and recipe appear in GREEN, Issue 017 of Le Sauce Magazine. braised artichokes. i mean, you just have to.